North Dakota is a state of the United States, named after the Dakota segment of the Sioux Native American Indians. Its U.S. postal abbreviation is ND. The entire state is covered by area code 701. The United States Navy vessels USS North Dakota and Flickertail State were named in honor of North Dakota. North Dakota is bordered on the north by the Canadian Provinces of Saskatchewan and Manitoba, on the west by Montana, on the south by South Dakota, and on the east, across the Red River of the North and the Bois de Sioux River, by Minnesota. The Missouri River flows through the western part of the state, forming Lake Sakakawea behind the Garrison Dam. Farms and ranches stretch across the rolling plains from the Red River Valley in the east to the rugged Badlands in the west. The geographic center of the North American continent is located near Rugby. North Dakota is a prime example of a continental climate; distant from major bodies of water to moderate the weather, conditions range from sweltering heat and humidity to bitter cold. Competing warm airmasses from the Gulf of Mexico and cold airmasses from the Arctic regions invaribly produce strong winds as they move in and out of the region. In summer, the clash of arctic and tropic systems often leads to strong thunderstorms, sometimes including damaging hail and tornadoes. In winter, the weather tends to be more stable — cold and dry, with occasional flurries—though the constant wind tends to create blowing snow at any time of the season. Severe snowstorms tend to manifest late in the fall or early in the spring, as was the case in 1997. North Dakota's reputation for severe weather has been cited by many as a motivating factor behind outmigration and the failure of outside industry to locate in the state, though some have found this to be a secondary factor to the overall economic situation in the state. The Dakotas made up the last arable region in the United States to be explored and settled. The French-Canadian trader La Vérendrye was the first documented non-Native American explorer of the area, leading a party to the Mandan villages about 1738. The trading arrangement between tribes was such that North Dakota tribes rarely dealt directly with Europeans. However, the native tribes were in sufficient contact that by the time of Lewis and Clark, they were at least somewhat aware of the French, then Spanish claims to their territory. The state was settled sparsely until the late 1800s, when the railroads pushed through the state, and aggressively marketed the land. On 2 November 1889, North Dakota was admitted to the Union with South Dakota. The territorial and early state governments were largely corrupt. Early in the 20th century, a wave of populism led by the Non Partisan League brought social reforms. The Great Depression was rough on the state and came several years early with the 1920s farm crisis. The original state capitol burned to the ground in the 1930s and was replaced by a concrete art deco skyscraper that still stands today. The 1950s brought a wave of federal construction projects, including Garrison Dam and the Minot and Grand Forks Air Force bases. The 1980s saw an oil boom in the Williston basin, as skyrocketing petroleum prices made development profitable, driving state population to a peak near 800,000. Since then the state has been experiencing a period of economic and demographic decline, and population is down to around 640,000, about as many as lived in the state in 1920s. The capital of North Dakota is Bismarck and its current governor is John Hoeven (Republican). Its two current U.S. senators are Kent Conrad (Dem-NPL) and Byron Dorgan (Dem-NPL). Its congressman is Earl Pomeroy (Dem-NPL). North Dakota has a bicameral legislature. The state elects two House Representatives and one Senator from each of 47 districts apportioned by population. The legislature meets in an 80-day regular session in odd-numbered years, and in special session if summoned by the governor. The major political parties in North Dakota are the Republican Party and the Democratic-NPL Party. However, North Dakota does have some active third parties. The Republican Party holds large majorities in the state legislature and generally wins the state's 3-member electoral college delegation; Since 1964, no Democratic presidential candidate has won North Dakota. In 2004, George W. Bush won with 62.9% of the vote. On the other hand, Dem-NPL candidates for North Dakota's federal Senate and Congressional seats have won every election since 1986. The structure of North Dakota's judiciary is not terribly complex. Each of the 53 counties has a court, from which appeals are sent directly to the North Dakota Supreme Court. Because of the expense of having each county hire a judge, and the fairly low workload, the state is divided into seven judicial districts which collectively elect judges to travel to the various courthouses and hear cases. District Judges are elected to six-year terms. Supreme Court Judges are elected to ten-year terms. The Supreme Court Justice is selected every 5 years by vote of the District and Supreme Court Judges. The U.S. Bureau of Economic Analysis estimates that North Dakota's total state product in 2003 was $21 billion. Per capital personal income in 2003 was $28,922, 32nd in the nation. Agricultural activity is largely dependent on rainfall. Wheat (particularly the durum variety used for pasta), barley, soybeans, sunflowers, and flax are present throughout the state, the wetter Red River Valley is dominated by farms, with the chief crops being Sugar beets and maize. Cattle ranches are more common in the dry southwest, though dairy ranches are more common toward the east. Honey is produced in the central part of the state. Small quantities of juneberries and grapes support a modest domestic winery industry. The state's small industrial output includes electric power, food processing, machinery (including Bobcat heavy equipment), lignite mining, and tourism. North Dakota has the only state-owned bank in the United States, the Bank of North Dakota. The bank, by law, holds all funds of all state and local government agencies in North Dakota. Its deposits are not guaranteed by the FDIC, but by the State of North Dakota itself. According to the U.S. Census Bureau, as of 2004, North Dakota's population was 634,366. The state's population had declined nearly 8,000 since 2000, a 1.2% drop. North Dakota is 47th of the 50 states in population, ahead of only Vermont, Alaska, and Wyoming. The five largest ancestry groups in North Dakota are: German (43.9%), Norwegian (30.1%), Irish (7.7%), Native American (5%), Swedish (5%). Most North Dakotans are of Northern European descent, especially Scandinavian and German. People of German ancestry are present throughout the state, especially the southern and central counties, and Scandinavians are also present throughout. A few counties have large Native American populations (principally on reservations). Individuals counties in western North Dakota have the largest white, Russian, Ukrainian, and Hungarian percentages of any county. 6.1% of North Dakota's population were reported as under 5, 25% under 18, and 14.7% were 65 or older. Females made up approximately 50.1% of the population. North Dakota has experienced a decline in population over the last 20 years, primarily among skilled college graduates for whom there are few jobs in the state. State leaders have been at a loss to address the issue. Student loan forgiveness programs for health and education professionals have been initiated with some degree of success, but a larger program to forgive the loans of all college graduates residing in the state for a given period of time failed to pass a referendum. Some federal politicians, including Byron Dorgan, have proposed a new "Homestead Act" to incentivize living in areas losing population through tax breaks and other considerations, but these have also made little headway. Many North Dakota politicians believe that better economic development programs will eventually resolve the issue, but opinions are mixed as to what exactly that would entail. The population trends in the state are noting a distinct shift from the rural areas to the larger cities. Most of North Dakota's largest communities grew between 1990 and 2000. Between 1990 and 2000, the USA as a whole grew by 13.1%, yet North Dakota grew a mere 0.5%. It is the only state (along with Washington DC) whose population declined (by 1.3%) between April 1, 2000 and July 1, 2003; this decline has become a major political issue. North Dakota's leaders frequently boast that the educational scene in the state is excellent. However, because the economic situation is no match for it, many skilled graduates leave the state. North Dakota boasts one of the healthiest higher education scenes in the nation. There are 11 public colleges and universities, five tribal community colleges, and four private schools in the state. The largest and oldest institution is the University of North Dakota in Grand Forks. A bill for statehood for North and South Dakota (and Montana, and Washington) was passed on February 22, 1889 during the Administration of Grover Cleveland. It was left to his successor Benjamin Harrison to sign proclamations formally admitting North and South Dakota to the Union on November 2, 1889. However, the rivalry between the northern and southern territories presented a dilemma: only one, upon the President's signature on the proclamation, could gain the distinction of being admitted before the other. So Harrison directed his Secretary of State James Blaine to shuffle the papers and obscure from him which he was signing first, and the priority went unrecorded. 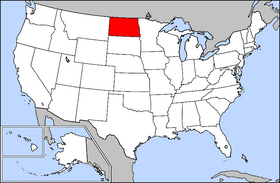 The Flickertail State is one of North Dakota's nicknames. The nickname is derived from Richardson's Ground Squirrel (Spermophilus richardsonii), a very common animal in the region. The squirrel constantly flicks its tail in a distinctive manner. In 1953, legislation to make the squirrel the state animal was voted down in the state legislature.